In translation studies it is sometimes assumed that bilinguals take a specific approach to translations and/or are in possession of a special competence for translating. In this paper I describe a research project which will investigate aspects of bilingualism and translation. The main questions will be whether the two languages of bilinguals play a positive or negative role in translation; whether and to what extent they favour or hinder it. Answers to these questions will be sought by pursuing two approaches. First, the relevant literature on bilingualism and translation will be reviewed. One focus of interest is the mental representation of the two languages in bilinguals. Second, an empirical investigation will be carried out with bilingual subjects. By means of a special methodology data will be gathered that should yeild important hints as to how subjects make use of their two languages in translation. The results of this research project should not only yield relevant insights for the description and improvement of bilingual translation processes but also for a theory of the development of translation competence in general. ©inTRAlinea & Wolfgang Lörscher (2014). "Bilingualism and Translation Competence A Research Project and Its Projected Results"
In translation studies it is sometimes assumed that bilinguals take a specific approach to translations and/or are in possession of a special competence for translating. The most extreme form of this view is held by Brian Harris in his hypothesis of a ‘natural translation’. According to this, bilingualism is not only a competence in two languages but also a competence of mediating between the two languages. In the research project described in this paper, I will investigate two aspects of bilingualism and translation . Two of the main questions will be whether the two languages of bilinguals play a positive or negative role in translation, and whether they favour or hinder it. Answers to these questions will be sought by pursuing two approaches. First, the relevant literature on bilingualism and translation will be reviewed. One focus of interest is the mental representation of the two languages in bilinguals. Are these represented in the same or in different areas of the brain? Thus light could also be shed on the forms and functions of the mutual influences of the two languages according to their mental representation. on how meanings are constituted, represented and retrieved by the subjects, and what role the two languages play in these processes. The first goes back to Bloomfield (1933) and Halliday/McIntosh/Strevens (1964). According to them bilingualism occurs when an individual can use each of the two languages in communication in such a way that s/he will be considered a native speaker in each of the respective speech communities. The degree of competence in each of the two languages thus has to be very high, native or native-like, and largely the same in the two languages involved. Bilingual competence is therefore an extremely rare case characterised by discreteness. One either possesses bilingual competence (in its entirety) or one does not. According to this maximalist definition bilingualism is an exotic, exceptional phenomenon which hardly occurs in reality. The second concept of bilingualism is extremely wide and thus largely the opposite of the one mentioned above. According to it bilingualism occurs when ‘a speaker can (...) produce complete meaningful utterances in the other language’ (Haugen 1956), or has skills in one of the four modalities (speaking, listening, writing or reading) (MacNamara 1969; Appel / Muysken 1987). Any real, i.e. communicative, use of a second language, however limited this use may be, is thus considered bilingualism. Even though a person’s competence in the non-native language was extremely limited and possibly restricted to one modality only, this person would nonetheless be subsumed under the heading of bilingualism. The concept is so widely defined that according to it nearly every person can be said to be bilingual. Almost every individual can utter a greeting, a farewell or something similar in a foreign language. In contrast to the narrow definition of bilingualism, which restricted the phenomenon to an extremely small number of people, the wide definition considers bilingualism to be the norm rather than an exception. A third concept of bilingualism takes a medial position between the very narrow and the very wide concepts outlined above. According to this version, bilingualism occurs when an individual uses or has to use two languages – or two varieties of the same language – in the conduct of her/his daily life. (e.g. Grosjean 2001) This also means that competence in each of the two languages (or varieties) can vary considerably both with respect to the various skills (speaking, writing, reading and listening), and with respect to the content to be communicated (e.g. the weather, a holiday) as well as the domain of the communication (e.g. an everyday conversation, an enquiry at a car registration office). The fact that translation – together with code switching and code mixing – occurs frequently among bilinguals is the ultimate reason why translation studies scholars are interested in bilingualism. It is an obvious fact that translation competence, as possessed by professional translators, is the result of a developmental process that is never final. The process is based on a predisposition to translate which every individual is endowed with. This innate predisposition is not controversial in translation theory. What is most controversial, however, is the way translation competence develops from an individual's innate predisposition. At the moment two highly controversial developmental models exist: natural translation and the concept of translation as transfer. […]all translators have to be bilingual and […] all bilinguals can translate. In addition to some competence in two languages Li and Lj, they all possess a third competence, that of translating from Li to Lj and vice versa. Bilingualism is therefore a triple, not a double, competence: and the third competence is bi-directional. Translation competence in the sense of natural translation is thus considered to be an aspect of bilingual competence. It is a natural phenomenon of bilinguals and must not be confused with translation competence as possessed by professional translators. With respect to the findings presented in section 2 the assumption that all bilinguals can translate can definitely not be corroborated (cf. Grosjean 2001). There appear to be several reasons for this. The following three may be of special importance. First, even though bilinguals have competence in two languages these competences are usually not of exactly the same kind. They may be more competent for a particular topic in language A than in language B. Second, bilinguals often lack the meta-lingual and meta-cultural awareness necessary for rendering a source-language text effectively into a target-language and culture. And third, bilinguals’ competence in two languages does not necessarily include competence in transferring meanings and/or forms from one language into the other. 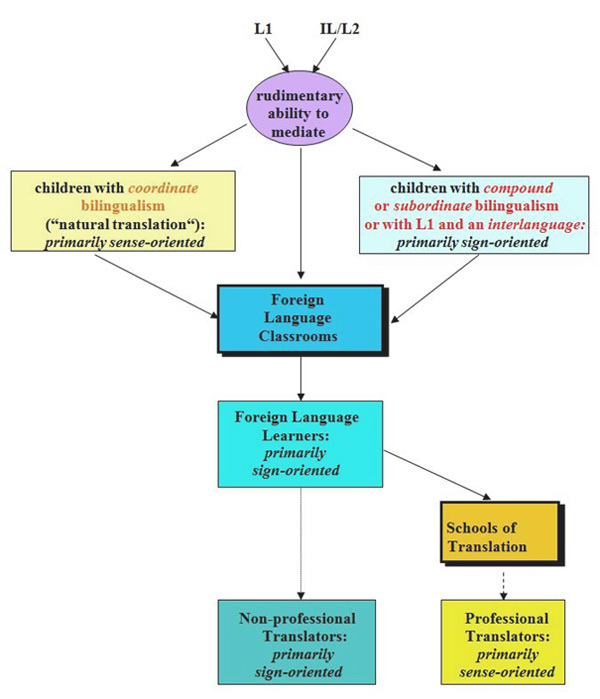 The second developmental model of translation competence was proposed by Toury (1986). He agrees with Harris and Sherwood about an innate predisposition to translate and considers it to be ‘co‑extensive with bilingualism’. The differences between the two concepts become evident when Toury points out that translation competence does not develop quasi‑automatically and parallel to the development of a child's bilingualism. Bilingualism is considered to be a necessary, but not a sufficient condition for the development of translation competence. In addition to an individual's bilingual or quasi‑bilingual competence an interlingual or transfer competence must be built up. Apart from other possible but hitherto unknown factors, this comprises the individual's ability to transfer texts equivalently on various levels according to a given purpose/aim and respecting their sense, communicative function(s), style, text type, and/or other factors; or to deliberately violate postulates of equivalence for a certain purpose (Hönig/Kußmaul 1982; Reiß/Vermeer 1984). Translation competence, according to Toury, can thus be considered to be the sum of bilingual competence and Interlingual transfer competence. This concept goes back to Lörscher (1991a, 1991b). I shall only outline its main points here. The concept assumes that every individual who has a command of two or more languages (even with various degrees of proficiency) is also endowed with a rudimentary ability to mediate information between these languages. The rudimentary ability to mediate realises itself in performance products which we shall call translations, even if they are imperfect or restricted. The rudimentary ability to mediate can be considered a special case of at least two universal innate abilities of the human intellect: that of categorizing and that of comparing, of differentiating between similarities and dissimilarities. Both of these abilities, which also underlie any natural linguistic competence, make it possible for an individual to express sense and/or connections of signs in different ways. The mediations of sense and/or signs can occur within the verbal sphere, between the verbal and the nonverbal spheres and between different nonverbal spheres. As soon as an individual has at least partially acquired modes of verbal and/or nonverbal behaviour, rudimentary mediation between them is possible. Based on innate abilities of the human mind, the rudimentary ability to mediate and its modes of realization function irrespective of the genuineness of the mediating situation and irrespective of the naturalness of its communication. As a consequence translation competence is considered to equal ( an even partial) competence in the languages involved plus an interlingual (rudimentary) ability to mediate plus training/experience in translation. 1. Do bilinguals process words, sentences and discourse of each of the two languages in the same way? In the relevant literature there seems to be some evidence for this assumption (cf. Fabbro 2001, Nicol 2001). In the processing of a language in which a person has a lower degree of competence, pragmatic factors are more strongly employed as means of compensation. 2. Do bilinguals process words, sentences and discourse of each of the two languages in the same way as monolinguals do or are there specific, bilingual processing mechanisms? In the relevant literature there is a high degree of evidence for identical language processing among bilinguals and monolinguals. Specific bilingual mechanisms of language processing seem not to exist (cf. Fabbro 2001, Nicol 2001). 3. Are there in the bilingual brain two mental lexicons, which are automatically kept apart (independent storage) or does the bilingual brain only possess one mental lexicon with a mechanism that relates the respective entries to the respective language in communication (interdependent storage)? The number of memory stores seems to depend on the type of bilingualism involved (compound, coordinate, subordinate). Compound bilingualism is characterised by one set of meaning representations for both languages and two modes of expression, one for any of the two languages. This may suggest one mental lexicon for the two languages. This is still a matter of controversy, however (Fabbro 2001, Nicol 2001, Appel/Muysken 1987). In coordinate bilingualism there are two sets of meaning representations, one for each of the two languages, as well as two modes of expression, one for each of the two languages. This type of bilingualism may suggest the existence of two mental lexicons. But there is no unanimous consent about this (Fabbro 2001, Nicol 2001, Appel/Muysken 1987). Subordinate bilingualism is characterised by one set of meaning representations, for L1, and two modes of expression of which the one for L2 is learned by means of that for L1. Subordinate bilingualism suggests the existence of one mental lexicon and one in the process of construction (Fabbro 2001, Nicol 2001, Appel/Muysken 1987). There is still a third possibility, i.e. the possible existence of three memory stores: one conceptual store, for encyclopaedic knowledge, and two language stores, for meaning representations and modes of expression for each of the two languages. 4. Are the languages of bilinguals mentally represented in one or two memory stores? These go back to Scoresby-Jackson (1867) and postulate that both languages, at least to a large extent, are stored in different cortical areas. This view could not be corroborated. Neither electrophysiological studies (event-related potentials, ERPs, e.g. N500), nor the more advanced functional neuroanatomy studies (positron emission tomography, PET, or functional magnetic resonance imaging, fMRI) support these models. The measurable cerebral activation occurs in the same cortical areas in both bilinguals and monolinguals and independently of the language used. A possible reason is that bilingualism is to be subsumed under the general human faculty of using varieties or, more generally, sign systems in communication in a situationally adequate way (as described above). These go back to Pitres (1895) and Minkowski (1927) who assume that both languages, at least to a large extent, are stored in the same cortical areas of the left and the right hemispheres. Electrophysiological, as well functional neuroanatomy, studies have shown that the same cerebral activation occurs with both bilinguals and monolinguals in word-, sentence-and text-processing. Accordingly, one-store models are generally preferred. A special type of one-store models is the two-component model. With respect to translation Fabbro (2001) and Paradis (1984) assume a two-component model with two neurofunctionally separate and autonomous components in the same cortical area. These are responsible for translation and work in a way that is relatively independent of the reception and production systems. One component is responsible for translation from language A to language B, the other for translation from language B to language A. Translation processes in bilinguals are likely to differ from translation processes of non-bilinguals (i.e. people with a native language and an interlanguage) not in principle, but only by degree. As a matter of fact, it can be observed that many bilinguals have both subjective and objective problems in translating and in interpreting. This is probably not caused by any specifics of the neuronal processes but by the interaction of the two languages. The problems are probably similar to those of monolinguals, when they transfer meaning-sign-combinations from one register into another or from one variety into another. Since little evidence for these phenomena can be found, the investigation of bilingual translation competence is a desideratum in research. In this research project three goals will be pursued. First, psycholinguistic aspects of the mental translation process will be investigated by analysing translation performance. This will be done in order to reconstruct translation strategies. These underlie translation performance, operate in the translation process and thus are not accessible to direct inspection. Second, insights into the combined use of the two languages of bilinguals during their translation processes will be gained. And third, knowledge about aspects of the development of bilinguals’ translation competence will be acquired. The basis of the investigation will be a corpus of data consisting of translations performed by 22 bilinguals (in the sense of Grosjean’s definition). As one of the aims of the research project is to find out how bilinguals’ translation competence develops, the subjects chosen will not be trained but will be “native translators’ (Toury 1986). Furthermore, their experience in translating will vary considerably. This should yield insights into the respective stage of development of the subject’s translation competence. As far as the methodology which will be employed in investigating bilingual translation processes is concerned, a distinction can be made between methods and procedures for the elicitation of data and those for the analysis and evaluation of data. For the investigation of the 22 bilingual subjects’ mental processes, introspective procedures (thinking-aloud) will be employed. In recent years many arguments have been put forward concerning the advantages and disadvantages of thinking‑aloud. Elsewhere I dicuss seven arguments in favour of this method for eliciting information about translation processes (Lörscher 1991b). As a conclusion, I point out that thinking‑aloud is a useful tool for collecting data about mental processes in general, and translation processes in particular, if we take into account the conditions under which the data are externalised and their inherent limitations (Ericsson/Simon 1984). To minimize these limitations retrospective procedures (ex-post thinking-aloud, retrospective probing immediately after translation task) will also be employed. Such a combination of introspective and retrospective methods is designed to minimize the weaknesses of each procedure when it is used separately. This triangulation of methods is also proposed by Ericsson and Simon (1984). The subjects’ translations, their thinking-aloud protocols interwoven with the translations and the retrospective information will be video-recorded and will serve as one set of data for analysis. Furthermore the tracking system TRANSLOG will be used by the bilingual subjects. The TRANSLOG recordings will serve as a second set of data for analysis. It is hoped that by means of a combination of introspective and retrospective procedures together with the data documented by the TRANSLOG system a rich and valid data corpus can be compiled. The analysis and evaluation of data will be carried out by means of an interpretive approach, as this is customary in performance analysis. The primary aim of this approach is the hypothetical reconstruction of sense relations. In the process of interpretive reconstruction, certain data is interpreted as (observable) indicators of (unobservable, mental) translation strategies. These indicators represent the basis for the formation of hypotheses on the mental translation process. A more detailed description of these phenomena is contained in Lörscher (1991a: 56ff). The process of knowledge accumulation with respect to translation strategies has a dialectical nature. On the one hand, the analysts must have some knowledge of the concept of translation strategy in order to be able to ascribe the status of strategy indicators to certain signs. On the other hand, it is only by their indicators that translation strategies are constituted, so that knowledge of them can, to a very large extent, only be gained by means of strategy indicators. Therefore, the analysts must often proceed in a speculative and hypothetical way. They often do not interpret certain signs to be indicators as a result of their knowledge of the respective entity or of the relationship between an indicator and a segment of reality, but rather on the basis of considerations of probability. These can be corroborated or turn out to be false in the course of accumulating further knowledge of the phenomena and of gathering more experience in interpretation. The description and analysis of translation processes of bilinguals: what status and roles do the two languages play for the bilinguals? In what ways do bilinguals use the two languages to deal with translation problems and try to solve them? What aspects of bilingual competence can help or hinder translation? Approaches to describing, as well as improving, the efficiency of translation processes among bilinguals, e.g. by comparing successful with unsuccessful translation processes and ascertaining what factors may be responsible for this success or failure. Approaches to describing, as well as improving, the efficiency of translation processes among non-bilinguals, since the differences between bilingual and non-bilingual language competence are by degree and not in principle. A theory of the development of translation competence in general. As the investigations into the mental translation processes of professional and non-professional translators suggest, the process-oriented approach to translation is a decisive indicator of the developmental stage of translation competence (Lörscher 2002). By means of an investigation into bilingual translation processes insights could be gained as to whether, and to what extent, bilinguals take a sign- or a sense-oriented approach to translation. Elsewhere (e.g. Lörscher 1995) I have presented considerations concerning a developmental model of translation competence. These were based on a corpus of translations performed by (advanced) foreign language learners and professional translators. The mediations performed by foreign language learners were characterized by primarily sign-oriented procedures. They were made possible by a mother tongue competence in their native language and a partial (interlanguage) competence in a foreign language. The mediations normally took place in artificial mediating situations. They neither make communication possible nor easier, but serve didactic purposes. Professional translators took a primarily sense-oriented approach to translation. Their developed mediating competence is based on a quasi-bilingual competence and unfolds itself in real mediating situations in which genuine communication takes place. Hypothetically, it can be concluded that the rudimentary mediating competence and its forms of realization in elementary translations, as can be observed with (coordinate bilingual) children in the sense of a natural translation, are characterized by a sense-oriented approach to translation. The rudimentary ability to mediate is based on a bilingual competence and unfolds itself in real mediating situations for the purpose of making communication possible or easier. Children with compound or subordinate bilingualism, in contrast, may take a mainly sign-oriented approach to translation. The research project described here will hopefully illuminate whether, or to what extent, this hypothesis can be corroborated. The rudimentary mediating competence in its largely sense‑oriented forms manifests itself in coordinate bilingual children's natural translation. In the foreign language classroom, in which translation is taken out of its communicative dimension and functionalized for the training and testing of foreign language skills, this rudimentary ability to mediate undergoes a decisive deformation. It is largely reduced to the level of signs. This is documented in the translations of the foreign language learners and generally remains with non‑professional translators. It is the task of the schools of translation to reverse this deformation. The professionals whom they train approach translations in a primarily sense‑oriented way and thus adopt procedures used by coordinate bilingual children. With regard to their approach to translation, coordinate bilingual children and professional translators have thus more in common with each other than with foreign language learners. It is, therefore, an urgent task, especially for the schools, to search for possibilities of developing the rudimentary mediating competence towards an elaborated translation competence. By maintaining an apparently inadequate concept and view of translation, this development has far too often been seriously hindered. Appel, R. and P.Muysken (1987) Language Contact and Bilingualism, London, Edward Arnold. Blanken, G., J. Dittman, H. Grimm, J. C. Marshall, and C.-W. Wallesch (eds) (1993) Linguistics disorders and pathologies, Berlin, de Gruyter. Bloomfield, K. (1933) Language, New York, Henry Holt. Fabbro, F. (2001) “The Bilingual Brain: Cerebral Representation of Languages”, Brain and Language 79 (2001), 211–222. Gerver, D. and H.W. Sinaiko (eds) (1978) Language Interpretation and Communication. New York and London, Plenum Press. 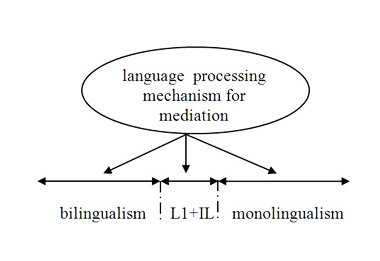 Grosjean, F. (2001) “The Bilingual’s Language Modes” in One Mind, Two Languages: Bilingual Language Processing, J. Nicol (ed. ), Oxford, Blackwell: 1­–22. Halliday, M.A.K., A. McIntosh, and P. Strevens (1964) The Linguistic Sciences and Language Teaching, London, Longman. Harris, B. (1977) “The importance of natural translation”, Working Papers on Bilingualism 12, 96–114. Harris, B. and B. Sherwood (1978) “Translation as an innate skill” in Language Interpretation and Communication, D. Gerver and H.W. Sinaiko (eds), New York and London, Plenum Press: 155–170. Haugen, E. (1956) Bilingualism in the Americas: A Bibliography and Research Guide, Alabama, University of Alabama Press. Hönig, H.G. and P. Kussmaul (1982) Strategie der Übersetzung. Ein Lehr- und Arbeitsbuch, Tübingen, Gunter Narr Verlag. Kelly, L.G. (ed.) (1969) Description and measurement of bilingualism, Toronto, University of Toronto Press. Lörscher, W. (1991a) Translation Performance, Translation Process and Translation Strategies. A Psycholinguistic Investigation, Tübingen, Gunter Narr Verlag. Lörscher, W. (1991b) “Thinking-Aloud as a Method for Collecting Data on Translation Processes” in Empirical Research in Translation and Intercultural Studies. Selected Papers of the TRANSIF Seminar, Savonlinna 1988, S. Tirkkonen-Condit (ed. ), Tübingen, Gunter Narr Verlag: 67–77. Lörscher, W. (1995) “Process‑Oriented Approaches to Translation and the Development of Translation Competence” in Basic Issues in Translation Studies. Proceedings of the Fifth International Conference, University of Leipzig, 25‑27 June 1991: Alternative Models of Translation, Albrecht Neubert, Gregory M. Shreve and Klaus Gommlich (eds. ), Kent Forum on Translation Studies, Volume II, Kent, OH, t­he Institute for Applied Linguistics: 113–121. Lörscher, W. (2002) “Translation Process Analysis Within a Framework of Systemic Linguistics” in Text – Text Structure – Text Type. Festschrift for Wolfgang Thiele, Christian Todenhagen (ed. ), Tübingen, Stauffenburg Verlag, 117–127. MacNamara, J. (1969) “How can we measure the extent of a person’s bilingual proficiency?” in Description and measurement of bilingualism, L.G. Kelly (ed. ), Toronto, University of Toronto Press: 80–97. Minkowski, M. (1927) “A clinical contribution to the study of polyglot aphasia especially with respect to Swiss-German” in Readings on Aphasia in Bilinguals and Polyglots, M. Paradis (ed. ), Montréal, Didier: 205–232. Nicol, J.L. (ed.) (2001) One Mind, Two Languages: Bilingual language processing, Malden, MA, Blackwell Publishers. Paradis, M. (ed.) (1983) Readings on Aphasia in Bilinguals and Polyglots, Montréal, Didier. Paradis, M. (1984) “Aphasie et traduction”, META, no. 24: 57–67. Paradis, M. (1993) “Multilingualism and aphasia” in Linguistics disorders and pathologies, G. Blanken, J. Dittman, H. Grimm, J. C. Marshall, and C.-W. Wallesch (eds), Berlin, de Gruyter: 278–288. Paradis, M. (1998) “Language and communication in multilinguals” in Handbook of Neurolinguistics, B. Stemmer and H.A. Whitaker (eds), San Diego, Academic Press: 418–431. Pitres, A. (1895) “Aphasia in polyglots” in Readings on Aphasia in Bilinguals and Polyglots, M. Paradis (ed. ), Montréal, Didier: 26–49. Reiß, K. and H.J. Vermeer (1984) Grundlegung einer allgemeinen Translationstheorie, Tübingen, Max Niemeyer Verlag. Scoresby-Jackson, R.E. (1867) “Case of aphasia with right hemiplegia”, Edinburgh Medical Journal no. 12: 696–706. Selinker, L. (1972) “Interlanguage”, International Review of Applied Linguistics in Language Teaching (IRAL), no. 10(3): 209–231. Stemmer, B. and H.A. Whitaker (eds) (1998) Handbook of Neurolinguistics, San Diego, Academic Press. Tirkkonen-Condit, S. (ed.) (1991) Empirical Research in Translation and Intercultural Studies. Selected Papers of the TRANSIF Seminar, Savonlinna 1988,Tübingen, Gunter Narr Verlag. Toury, G. (1986) “Natural translation and the making of a native translator”, TEXTconTEXT, no. 1: 11–29. The concept of “natural translation” is discussed in detail in section 3.1 below. The hypothesis of an interlanguage goes back to Selinker 1972. It assumes that second language learners do not normally acquire the full competence in the target language but an interlanguage system sharing features of the native and the second language. received first academic drgree in English Studies and Political Science from University of Trier, Germany. Ph.D. (Dr. phil.) and habilitation (Dr. phil.habil.) at University of Essen, Germany. Since 1993 Full Professor of English Linguistics at University of Leipzig, Institute of British Studies. Publications on discourse analysis, text linguistics, psycholinguistics and translation studies.